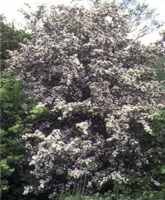 Douglas Hawthorne (Black Hawthorne) Crataegus douglasii - A deciduous shrub or small tree with white blooms in the spring followed by clusters of red edible berries. The fruits are eaten raw or are cooked and used for jellies, jams or desserts. Medicinally, the berries and blooms have been used to concoct a heart tonic. The bark is used to treat diarrhea and the thorns are sometimes used to treat arthritis. The plant prefers a moist soil in full sun or semi-shade (though full sun is best for fruit production) and is tolerant of air pollution. Hawthorne wood is used in the manufacture of tool handles, as it is tough and hard.. Very easy plant to grow and will make a good hedge. Like most other hawthorne varieties, they begin bearing fruit in 5-8 years from seed. Hardy to -10F (-23.3C); height: 30ft. Downy Hawthorne (Arnold Hawthorne) Crataegus mollis - Shrub or small tree with small white blooms followed by red edible berries carried in clusters. Fruits are used as those of C. douglasii (above) and a tea is sometimes made from the twigs. The plant prefers moist well drained soils in full sun or partial shade, is very tough and can take air pollutants and heavy trimming. It is very tolerant and can stand some drought. The blooms, like those of all hawthornes, have a distasteful smell. This species is nearly thornless. Hardy to -20F (-28.8C); height: 30ft. English Hawthorne (English Thorn) - Crataegus laevigata - Upright growth habit with small white or pink flowers in the spring and deep red fruit in the fall. The bushes are also covered with thorns, allowing it to be used as a formidable hedge. Hawthorn is often used in combination with ginkgo biloba as a memory enhancer. The bark is astringent and is used to treat inflammations and malaria and a concoction made from the roots is used as a heart tonic. The wood is lovely, but is so hard that it is very difficult to work. Hardy to -20F (-28.8C); height: 15ft. One Seed Hawthorne - Crataegus monogyna - This hawthorne species has white blooms and berries that are edible, but are used primarily as food for wildlife. They can be used to make jellies and jams, and are sometimes dried and used in baking, or as a coffee substitute. Medcinally, like other hawthorne species, it is used to treat heart problems, malaria and to enhance memory. Hardy to -20F (-28.8C); height: 15ft. 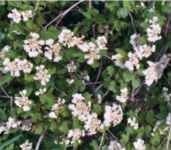 Washington Hawthorn (Washington Thorn) - Crataegus phaenopyrum or Crataegus cordata - Pyramidal growth habit with profuse white flowers. In fall, the tree turns a brilliant red and possesses bright red berries. Hardy to -40 (-39.9C); height: 30ft.